The Dr. Tan Balance Method is an incredibly effective approach that quickly creates results. This is a transformational treatment that holds 85% success rate with numerous patients, stating as much as a 50% reduction in pain within one treatment. Without a doubt, to keep the pain relief consistent, a course of treatment is required. The Balance Method is different because in stead of it being practiced once a week, it is completed 2-3 times a week and with much greater intensity. The reason for this is that the desired pain relief arrives at a more rapid pace, being within weeks rather than numerous months. This method seldom places needles in areas of discomfort or pain. For example, shoulder pain may be alleviated in the hips or within particular areas of the ankle, rather than the shoulder. Within minutes the pain can subside and aggravated area has less chance of causing discomfort. Think of treating an aggravated area like switching on a light bulb. The switch is far away from the bulb, maybe in the corner of the room or even on the ceiling. Once the switch is on, it creates a flow of electricity towards the light bulb. In a similar fashion, having needles placed into the hip can stimulate the flow of energy to the shoulder. To know which areas of the body should be chosen, a holographic system is used (similar to reflexology). Born in Taiwan, Dr. Tan was a master of Acupuncture, Chinese Herbs, Philosophy, Martial arts and held a Masters degree in Systems Engineering. His contribution to acupuncture was incredible, through his research of classical Chinese texts which emphasize that acupuncture should give instant results, he had created a method that does just that. The method was a combination of intense study of ancient Chinese literature, experiential acupuncture practice and modern scientific analysis. 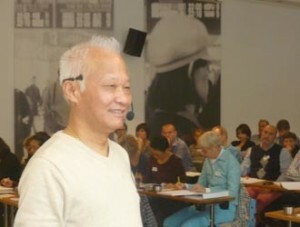 Dr. Tan had committed more that 25 years of teaching his method all over the world. He lived in San Diego USA, where he treated over 120 patients every seven days. It deeply saddens to announce the passing of Dr. Richard Teh-Fu Tan. Dr. Tan touched the lives of countless people in immeasurable ways. Dr. Tan’s wish is that the Balance Method lives on well beyond his death.